I grew up in northern Indiana, where tornado warnings rarely mean business. Tornadoes touched down in our area a handful of times when I lived there, but they were always weak storms that caused superficial damage at most. Now we’re living in southern Indiana, which is on the outer rim of tornado alley. 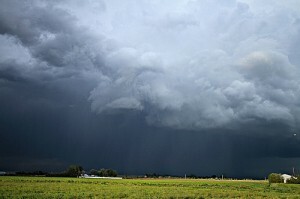 The deadly storms in the south and Midwest over the last few weeks have served as a wakeup call for me. I’m taking severe weather warnings a lot more seriously these days. Several weeks ago, before we moved into the house, we were living in a second floor apartment during some pretty severe storms. It was thundering and raining hard and the wind was heavy. The power went out. We weren’t really sure what to do or whether the situation was severe enough to warrant taking cover somewhere other than our second floor apartment. We decided to stay awake, hang tight, and take cover if things seemed to get worse outside. The next morning, we awoke to the news that a weak tornado had touched down just blocks from our apartment. It damaged some houses, knocked out some power lines, and downed trees. Thankfully, because the storm was weak, no one was hurt and no serious property damage was caused. But I felt uneasy knowing that a tornado had been so close, and we had no idea. Our situation is a little safer now that we live in a one-story brick house, but I want to be sure we can keep up with weather alerts, especially if the power goes out or a storm hits in the middle of the night. I did some searching for solutions, and last night I downloaded an app for my smart phone that works like a weather radio. It will buzz and notify me if severe warnings have been issued for my area. Because it doesn’t depend on my home Internet connection, I’ll receive alerts even in a power outage as long as my phone is charged. The updates come directly from the National Oceanic and Atmospheric Administration (NOAA). At $3.99, the iPhone version is a good value for the money considering the fact that weather radios cost anywhere from $30 – $100. You can download the iPhone version here. This particularly dangerous storm season isn’t over yet. Please stay safe, and be aware of alerts in your area, whether you use a smart phone, traditional weather radio, or local news reports. Previous post: Are you “financially fragile”? How to fix it. Good advice, Karen! Because I take storms very seriously, my parents bought us a weather radio years ago, and I can’t tell you how much relief it’s brought me. It’s nice to be able to get those alerts even in the middle of the night. Congrats on the new house, btw! It looks adorable.